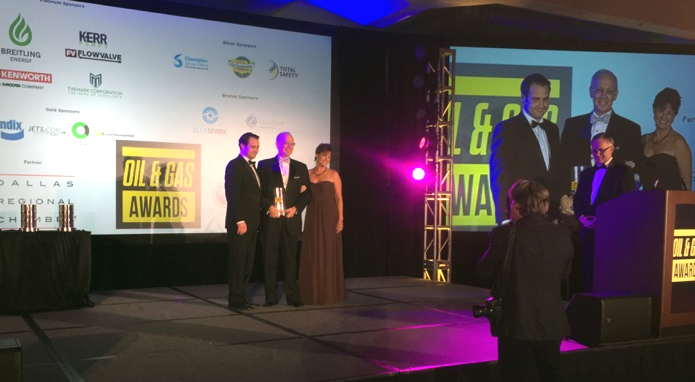 The final Industry Summit and Awards Gala Dinner presented by the Oil & Gas Awards for 2015 took place Thursday at The Westin Dallas Park Central. This being the local event for VZ Environmental we had 15 employees and family members in attendance. The event was a unanimous success among our crew. The morning was kicked off by Keynote speaker Christopher Guith, SVP Policy, US Chamber of Commerce – Institute for 21st Century Energy. When the Summit resumed after lunch we were treated to a very informative Keynote by Bruce Bullock, Director of the Maguire Energy Institute at Southern Methodist University. His topic was Cheap Oil – Who Wins? Who Loses? The Broader Political and Economic Implications. He delivered insightful oil pricing trend and forecasting information in an easy-to-understand way and shared his thoughts on the United States’ great opportunity in the World Oil Market. As well, his thoughts on when the price of oil will rebound to a more profitable and stable level. 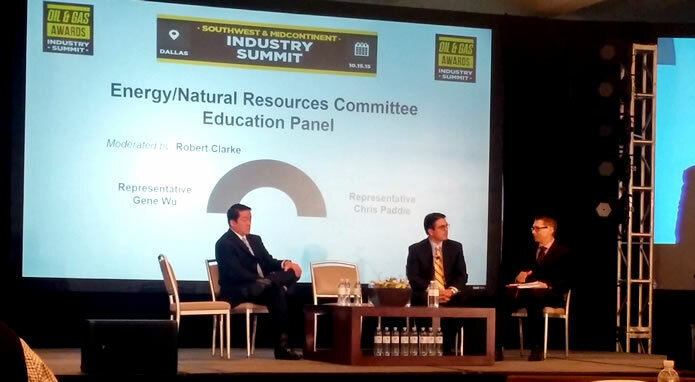 Representative Gene Wu and Representative Chris Paddie discuss HB40 and seismic activity in Texas during the Oil & Gas Awards Summit. How could the Oil & Gas Awards top that with more afternoon sessions to come? The next panel was Representative Gene Wu, District 137 Texas House of Representatives and Representative Chris Paddie, District 9 Texas House of Representatives. Two different political ideologies that shared common ground and differing opinions on House Bill 40 and recent seismic activity in Texas. Very informative and much respect to them for sharing with the Oil and Gas industry executives in attendance. Carol Van Zandt Jones presents the VZ Environmental Award for Excellence in Environmental Stewardship to Richard Haut of Houston Advanced Research Center. Just as with previous events we’ve attended by the Oil & Gas Awards the evenings celebration was first-class. A great networking opportunity for the packed house prior to the dinner and then the awards. As a previous recipient of awards VZ Environmental no longer submits our products and services for entry into any of the award categories. We now participate as a sponsor for one of the very awards we had won. After all, it is the crux of who we are as a company, that is, Excellence in Environmental Stewardship. The VZ Environmental Award for Excellence in Environmental Stewardship spotlights a company judged to be an industry leader in environmental stewardship. Congratulations to Houston Advanced Research Center (HARC) they were judged the best among many entrants that the Oil & Gas Awards received for the Southwest and Midcontinent region. HARC’s focus on energy is to accelerate the adoption of clean energy technologies and policies; finding solutions for environmentally friendly oil and gas development. HARC’s Clean Energy research bridges across cleaner energy options, environmental sensitivity, and economic feasibility. Making the transition to clean energy will require a coordinated effort led by non-partisan entities. HARC’s continued service to the Gulf Coast hinges on guiding policymakers and industry leaders towards improvements in areas such as energy efficiency, low impact oil and gas exploration, solar energy development, and combined heat and power projects. Accepting the award for his team of researchers was Richard Haut, PhD, Program Director, Energy Production. Congratulations to the following companies for their success in the 2015 Southwest & Midcontinent Oil & Gas Awards! Award for Drilling Excellence: Ensign Energy Services Inc.
Oilfield Services Company of the Year: Frank’s International N.V.
New Technology Development of the Year – Products: Drillform Technical Services Ltd.
Consultancy of the Year: KJE, Inc. Trucking Company of the Year – Presented by Kenworth: Ryder System Inc.
Bendix Commercial Vehicle Systems Award for Excellence in Health & Safety – Products: TekSolv, Inc.